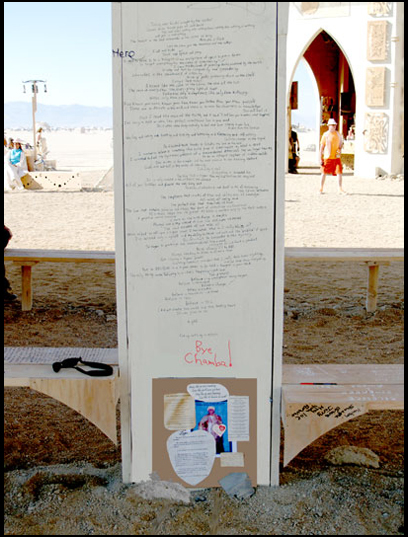 I was riding my bike on the playa of the Black Rock Desert on Thursday of Burning Man week and thinking about the shrine I was there to make at the Burning Man Temple to honor my friend Chamba who passed on May 24th. A perfect metaphor occurred in my mind that captured Chamba’s essence. Smiling, I determined to write it down. Two hours later it occurred to me that I had forgotten to record the perfect metaphor. It had evaporated like a dream. Then I thought - how about “Sweet and Sour Sauce” for my crusty, tender friend. Not bad for a second team metaphor, and perhaps even better. The best elements of Burning Man for me as a veteran of the event are the camaraderie with camp mates and the vast, flat open playa where I am free to wander. A new benefit this time was being able to read without distraction while my camp mates toured art installations and events throughout Black Rock City. I spent this time alone to read Chamba’s manuscript of stories from his colorful youth, which I had promised him I would publish after his passing. I was delighted with his writing. It was replete with his style of humor, both brusque and ironic, and included epiphanies and insights worthy of the most observant spiritual traveler. Sweet and sour indeed, but deep and tasty sauce too. 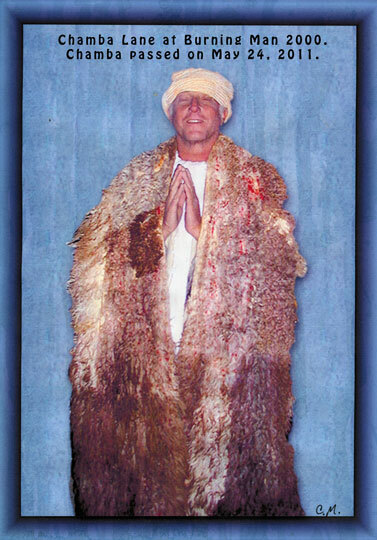 I was a little late on Thursday in placing a poster with Chamba’s picture and words-to-live-by at the Temple. I searched around the Temple grounds for a spot and found one at the base of a pillar. It was appropriate to position the poster at ground level, signifying Chamba’s earthiness. I propped the poster up with rocks found near the pillar. I noticed that there was writing above where I had placed the poster, but being busy adding duct tape to the poster edges, I didn’t read the poem. The duct tape felt apropos given Chamba’s penchant for using the most mundane materials to make things work. That evening I walked out to the Temple to check on the poster and see how the tape fared in the heat. It failed, and I decided to return in the morning with hammer and nail to fix the problem. The next morning I awoke at 6 and rode my bike to the Temple with tools. After finishing, I happened to read the long poem written above the poster. I was stunned, as it not only reflected clearly the truths I have learned about life and existence but also the deeper thoughts I had been reading in Chamba’s manuscript. The poem could have been written by Chamba, or perhaps through a human medium directed by Chamba’s spirit. Astonishing! Serendipity! A miracle to my mind! The poem is an apt memoriam for this unusual character known as Chamba. Friday afternoon, my camp mates and I went to the Temple to meet two of Chamba’s friends, and we wrote messages to Chamba. One friend made cairns out of the rocks to symbolize the Yuba River, while others made grooves in the sand to signify our holy river flowing to Chamba and the remarkable poem above his head. I scattered a few of his ashes and proclaimed him “Sweet and Sour Sauce. of the center of being. Spirit. To give a damn. yearning, storms weakened by the Earth. Life cubes in the storehouses of eternity. Wind-up gods gathering dust on the shelf. The core of every star. The ever-giving light of hope. and there is no room for cleverness or knowledge. unconditional love in your mind. and bothering and blathering and still nothing. No change in the signal. No finished task bends or breaks the love of the void. that could prove it didn’t require my belief to exist. to be an intrepid explorer of hidden worlds. Gods rise and fall in the wake of eternity. The true god is bigger than any god that can be imagined. and dwell in the all-becoming space between. The emptiness that cracks all fear and obliterates all knowledge. All wise, all caring void. The perfect love that transcends all form. the dust of uncountable civilizations. all filth is washed away by the dark waters. A mask for the truth. Always in masks. Always one step ahead of even the ultimate observer. The void evades all and holds all. When asked to call upon a higher power, I hesitated. What do I really believe in? I believe only in myself and my ability to work out the “problem” of spirit. So reluctant to surrender to the mystery. So eager to package the transcendental into a word, afterthought, a product. Never allowing it to BE. Always needing to know, to be more than. Not allowing a higher power. and can never know anything. But to BELIEVE in a higher power is to hold a thought in your head. The only thing worth believing is what is happening right now. Anonymous poem written on the wall above Chamba's memorial poster.